The first jig rod I ever caught a fish on was hand-made, nothing more than a crafted piece of wood. Today, 15 years later my rods are custom built from the finest graphite blanks and designed to catch specific fish and detect the lightest of bites. Ice fishing has gone through a major revolution in recent years. By all means, what you’ve got will work, but if you are willing to adapt to these new methods and tools then you will see more success on the ice. 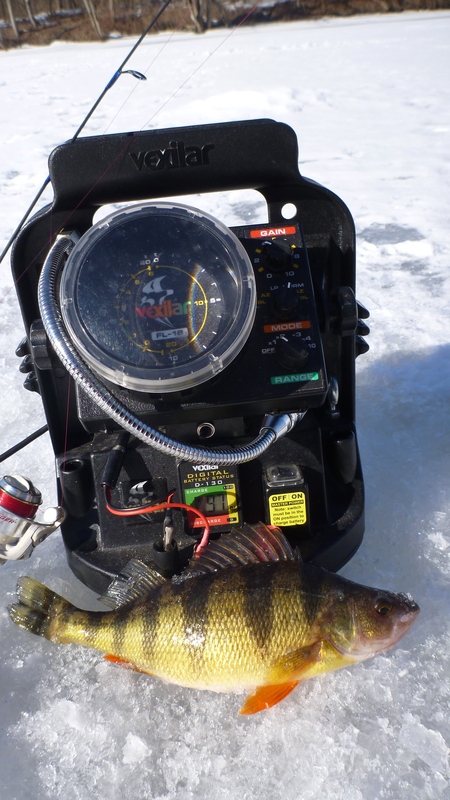 The modern age of ice fishing has created the finesse ice fishermen. It has become common practice to put down the large wooden jigs sticks with 10lb test and pick up a lighter graphite jig stick spooled with 2-4lb test, have boxes full of jigs, and carrying a Vexilar from hole to hole. All of these things are an essential tool for me while chasing panfish in the lakes and rivers of the Northeast. I have three rods that I use. The first is a True Blue made by Clam, the second is a custom built “Meatstick” by Jason Mitchell, and the last (which I use the most) is a Riversider. Each rod has it’s own productive qualities that help me detect bites in different situations. All of these rods are in my rod case because they are durable and they get the job done. These rods are also very affordable for the average “weekend warrior”, they are all pretty much under forty dollars. More important than the rod, is the jig. I mostly fish for bluegill, perch and crappie, having a variety of jigs is a huge advantage for me in catching fish. Believe it or not, I have found that smaller is usually better. There are two types of ice jigs on the market today, vertical and horizontal. Vertical jigs are soldered jigs and are for most fishermen their “go to jigs”. My favorite vertical jig is an orange and chartreuse teardrop Caty jig tipped with 3-4 spikes. These jigs are small, but the teardrop shaped blade gives it a deadly downward flutter, often times triggering the fish to bite. This action allows the fishermen to fish the entire water column, targeting the most active and aggressive fish. The second type of ice jig is a horizontal jig. These are somewhat new to the market and these jigs consist of molded metals in all shapes and sizes, and now metals, including tungsten which is heavier than lead. These jigs offer the fish a different presentation. Unlike the vertical jig, these jigs swim. They have a sudden side to side up and down movement that mimics small bait fish or a small insect. Teamed with a micro plastic, this bait can be very productive. My go to horizontal jigs are Custom Jigs and Spins Diamond Jigs, and their Gill Pill. One of these jigs tipped with a micro plastic, say by Maki Plactics, will surely put more fish on the ice. Out with the old and in with the new, well only if you want to. The old techniques will always work to a certain extent, but I encourage you to finesse more fish on the ice this season and try some of the tactics of the Modern Ice-Fishermen.